The French circuit of Dijon-Prenois hosted the FIA GT media and test day(s) today, April 11 – which included the first day of the final stage of the GT3 equalization procedure. The Zakspeed Saleen of Sascha Bert set the best time of the day, a 1:14.484, ahead of one of the Vitaphone Maseratis and the GLPK Carsport CorvetteC6.R. The top seven cars set times within a second. Scuderia Ecosse was atop the GT2 times, followed by two more F430 GTCs – and then the quicker Ebimotors Porsche. The Scottish Ferrari team is running on Michelins this year, and suggestions that they had been running very quickly on the French rubber at Jerez recently were confirmed by Tim Mullen’s 1:18.855 at Dijon. The Italian Porsche’s time may have been the fourth fastest (by a car), but Chris Niarchos set the fourth fastest by a driver. 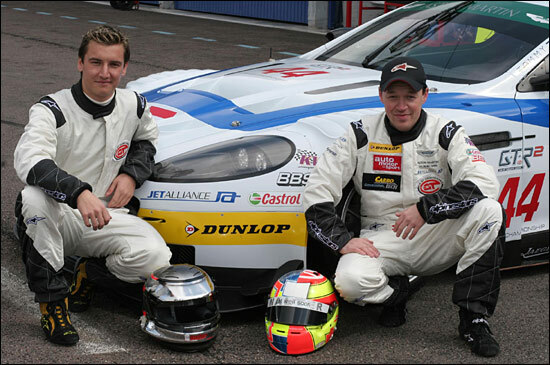 The Austrian team RaceAlliance team announced its driver line-up at Dijon, for its second car, with Robert Lechner and Frank Diefenbacher (below) set to drive the Aston Martin DBR9 - alongside Karl Wendlinger and Philipp Peter.